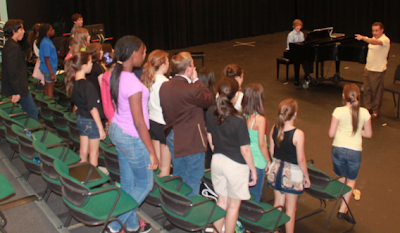 Noted tenor Paul Diaz-Cobo recently brought his talents, insight and wit to our Junior Choir class. Diaz-Cobo, a well-known opera singer whose credits include the Merry Widow, Faust, La Traviata, La Boheme and more, visited the Patel Conservatory’s Junior Choir class last week. The master class provided the students the opportunity to work with a professional classical singer. Accompanied by the Conservatory’s jazz quartet pianist Parker Wilkson, Diaz-Cobo performed for the students, then offered demonstrations of proper singing techniques. “Mr. Diaz-Cobo was very funny and provided some great insight into singing, breathing, and being confident on stage,” said Junior Choir instructor Kavanaugh Gillespie. "It was another wonderful opportunity where our students get to work with a current star in the business." You can check out our Junior Choir in the Conservatory’s upcoming Vocal and Instrumental Fall Concert on Oct. 22. You can see Wilkson perform when he accompanies the upcoming Patel Conservatory Theater production of A Little Princess and perform in the Jazz Jamm on Dec. 6. For tickets to more information or tickets to Patel Conservatory’s upcoming performances, please click here.